The Parson's exhibit How Things Don't Work: The Dreamspace of Victor Papanek should have the tagline, "There are few professions more harmful than industrial design." Every designer should see the show before it closes on December 15. There are many designers today who believe that design—what we might think of as the planning or intention behind the creation of a material object—can solve almost any physical problem. But the Austrian-born and American-educated designer Papanek, the subject of this exhibition, had a different and more expansive view of the field. Papanek suggested in 1971 that "there are few professions more harmful than industrial design." Papanek's thinking gravitated towards anthropology and ecology, and, as a product of the 1960s, he wanted to shake up the design profession and cut its ties to product design for corporations. Instead, he would rather have it engage with social needs and conditions. His own design biography includes working to create a $9.00 television for developing countries and famously creating an innovative method for dispersing seeds and fertilizer for reforestation in difficult-to-access lands. 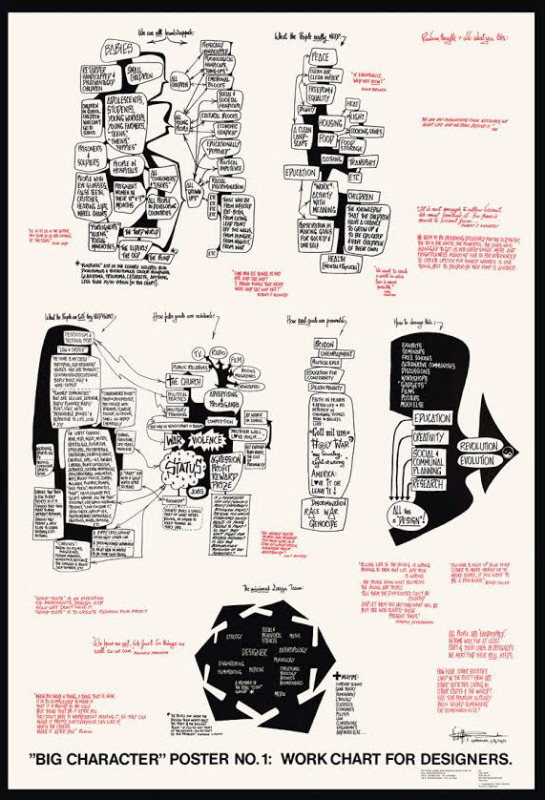 The exhibit focuses on Papanek's radical (for the design community) design theories, research, and propositions, and asks if they are still valid in the 21st century. He wanted the profession to be driven not just by social needs but low-tech, bottom-up designs geared toward the "underserved populations that he felt truly needed the work of designers: the poor, the disabled, and the disenfranchised." Like any good critic, he attacked his own field—industrial design—in popular books and as a teacher and academic where he challenged designers to do better, and this exhibit focuses on the failure of our designed systems to provide the infrastructure for sustainable, equitable living. 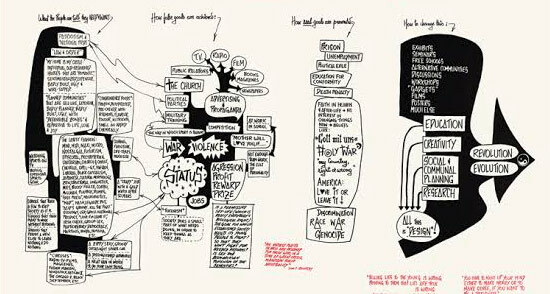 Parson's will sponsor "Permanent Garbage: Victor Papanek and Beautiful Visions of Failed Systems," a symposium on the designer on December 4, at 5:00 to 7:30p.m. in the Sheila C. Johnson Design Center, room L6. Symposium participants will include: Stuart Candy, Paola Antonelli, Gerald Bast, Alison Clarke, Fiona Raby and-Jamer Hunt. If you see only one design show this year make it How Things Don't Work at the The Sheila C. Johnson Design Center at Parsons. Archtober Building of the Day #3 The New School University Center 65 5th Avenue, New York, NY Skidmore, Owings & Merrill Designed by Skidmore, Owings & Merrill (SOM), the five-story academic building topped with student housing on the southeast corner of Fifth Avenue and 14th Street aggressively embraces its urban setting wearing a vivid zig zag expression of vertical circulation on its sleeve. The AIA New York Chapter held the most recent FitCity conference in its 800-seat auditorium last May. The site was selected for this annual event that brings public health and design professionals together, partly because stairs are the defining element of the structure. The principles of the NYC Active Design Guidelines, which encourage more physical activity in everyday life, are evident throughout the building, designed by SOM's Roger Duffy for a client team led by the New School's Vice President for Design, Construction & Facilities Lia Gartner. 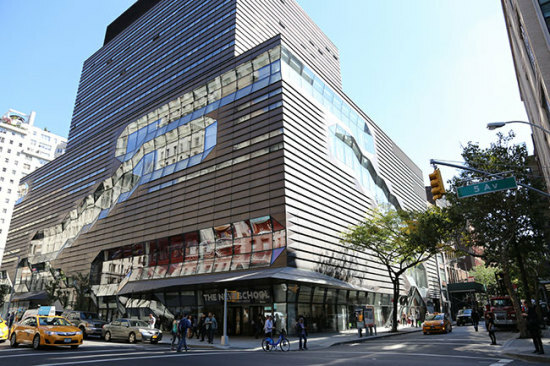 On today's Archtober tour, Duffy and Gartner said that the social spaces created at the intersection of perimeter stairs and activity space defined a sense of connection for the multi-disciplinary institution, founded in 1919 as The New School for Social Research. These connecting spaces bring social theorists together with those involved in more practical design. 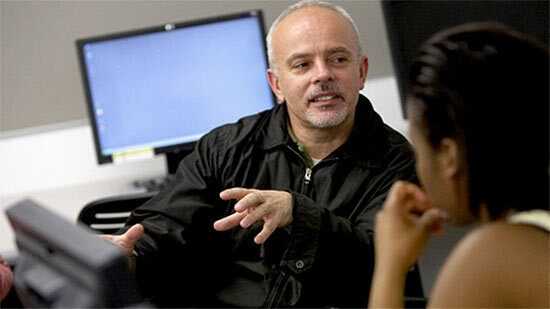 Philosophers rub elbows with Parsons’ architecture students and flamboyant fashion designers. 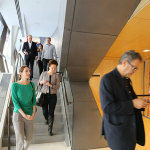 "The New School believes in interaction and connection, and the building's stairs create needed social spaces,"Gartner said on the tour. Duffy added, "This building is taking the public realm, the sidewalk, and wrapping it up onto the facade, connecting the activity of the sidewalks to the face of the buildings—you see a hive of activity from the street." Take the ferry to Staten Island for tomorrow's Building of the Day tour of the Stapleton Library by Andrew Berman, FAIA. Winner of the 2014 AIA National Edward C. Kemper Award, Rick Bell, FAIA, AIA New York Chapter Executive Director is blogging for the first time. 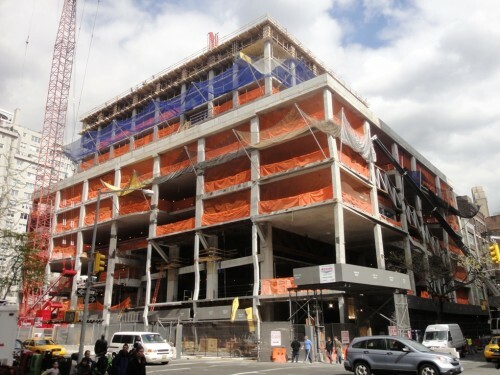 A dramatic 16-story building designed by SOM has continued construction on the corner of Fifth Avenue and 14th Street in Manhattan. The structure will eventually open at the University Center for The New School, and with its Muntz metal (a type of brass made of copper and zinc) and glass facade now in place, most of the activity is happening behind closed doors. Or in this case, on the roof only viewable from neighboring buildings. 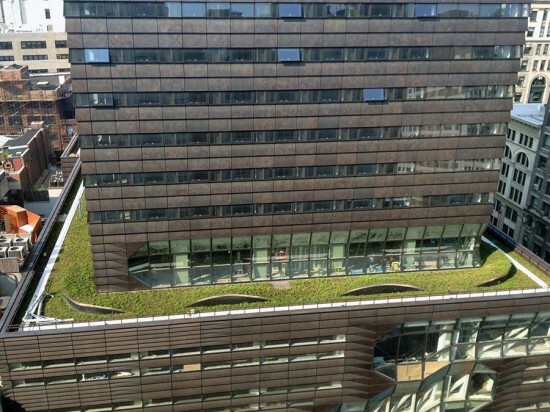 In late July, crews installed a thin emerald necklace where the building sets back including what appears to be a variety of sedum plants commonly found on green roofs. The building is expected to be complete this fall. In the meantime, read about SOM's unique approach to expressing circulation on the facade in an AN In Detail report. New York City will be hit by a design storm this May. Along with the International Contemporary Furniture Fair (ICFF) taking place May 18 through 21 at the Javits Center, The New School is throwing its annual Parsons Festival, May 5 through 24, at locations across the city. Both events feature cutting edge design establishing NYC as a major design capital. The Parsons Festival features student work from a range of disciplines including architecture, interior design, lighting design, communication design, product design, photography, film, and fine art. The public is invited to preview and engage with the various works from the graduating class of 2013, such as workshops, interactive installations, gallery openings, critiques, and more. The event will culminate in the school's annual Commencement Ceramony. This year, the Parsons Festival will help kickoff the first ever NYCxDESIGN, a 12-day fair that will highlight NYC's diverse design talent with a host of film festivals, trade shows, panel discussions, installations, and exhibitions featuring works from 40,000 NYC designers. Below are images from past Parsons Festivals. 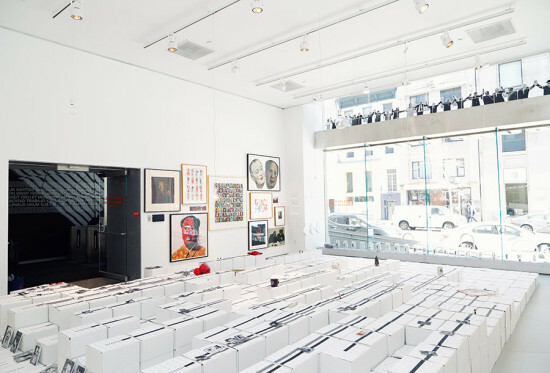 The Vera List Center for Art and Politics at the New School has—under its director Carin Kuoni—been an instigator in drawings links between artistic and design practices and the real world of politics. The Center sponsors symposia, lectures, and exhibitions that draw links that are often crucial and obvious but not discussed by professionals and academics in the design professions. 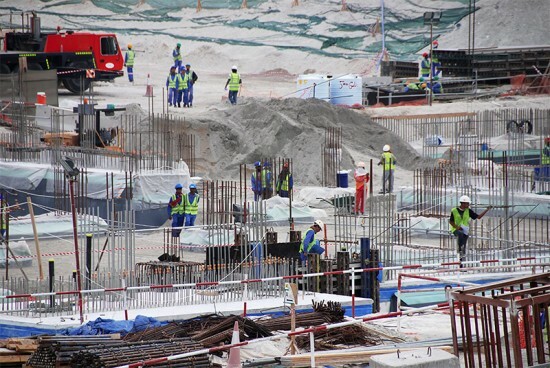 Once again it is highlighting such an issue with a series of discussions, Who Builds Your Architecture?, that connects construction and labor. This project emerged in part from two ongoing initiatives: Who's Building the Global U? by NYU faculty and students and Who's Building the Guggenheim Abu Dhabi? by a coalition of international scholars and curators. The second discussion in the series, WBYA 2.0, was titled Sustainability and Sustaining Human Life took place at The New School on Monday April 12 and featured an engaged panel that included: Phil Bernstein from Autodesk; Yale professor and dean Peggy Deamer; Ed Mayer, Senior Associate at FXFOWLE; Reinhold Martin, Columbia Associate Professor of Architecture; Walid Raad, Cooper Union Artist and Associate Professor; Brad Samuels, Pounding Partner at Situ Studio; William Sharples from SHoP Architects; Raphael Sperry, President, Architects/Designers/Planners for Social Responsibility; Columbia Planner Smita Srinivas; and Nisha Varia, a Senior Researcher at Human Rights Watch. The designers in the group tried to make connections between their work and that of those that build what comes off their drawings boards. Sharples, for example, showed images of his firm's new technology campus in Africa and described how the design is driven by a desire to have it manufactured and built by local African labor rather than by foreign contractors and builders. Whatever the reality of this project ends up being it did compel panelist Reinhold Martin to ask architects and designers to enlarge their notion of sustainability to include issues like labor rather than just focussing on technology and material issues as is most often the case in this country. Peggy Deamer who was one of the first architects to raise the issue of labor and architecture in writings like Practicing Practice brought the issue back home and pointed out that architects don't even think about labor practices in their own offices let along in far flung building sites in Africa and the Middle East. 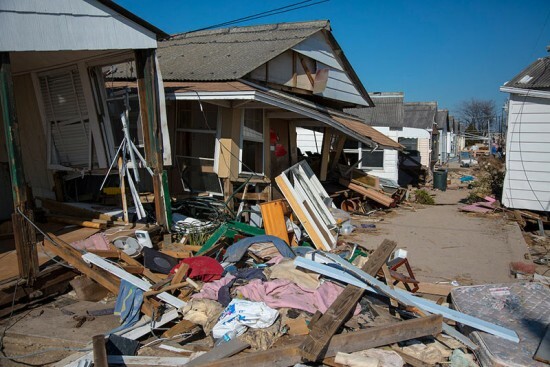 Architects, she pointed out, don't see themselves as laborers and this must change before they recognize the reality of actual design and construction. The event was organized by the Vera List Center in collaboration with Kadambari Baxi (Barnard+Columbia College, Architecture), Mabel O. Wilson (Columbia University GSAPP), curator and writer Beth Stryker, and Jordan Carver (Columbia University GSAPP) whose goal is to jumpstart a conversation that will lead to longer term solutions. Parsons The New School of Design has recently completed a new pool pavilion called Splash House for Highbridge Pool and Recreation Center. 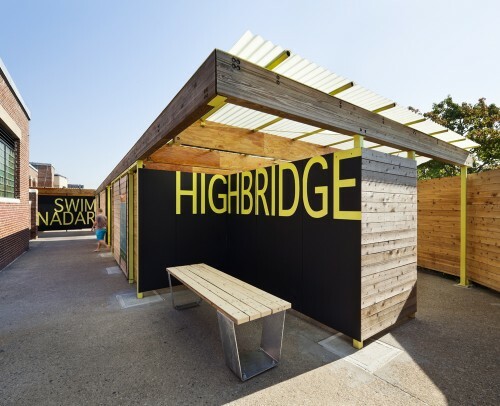 Led by students in the School of Constructed Environments at Parsons, Splash House was designed and developed pro bono by students in partnership with NYC Parks & Recreation as an addition to the WPA-era Highbridge Pool and Recreation Center. Included in the pavilion's construction are new locker areas surrounded by sliding doors that allow the space to be converted into changing rooms during peak hours. 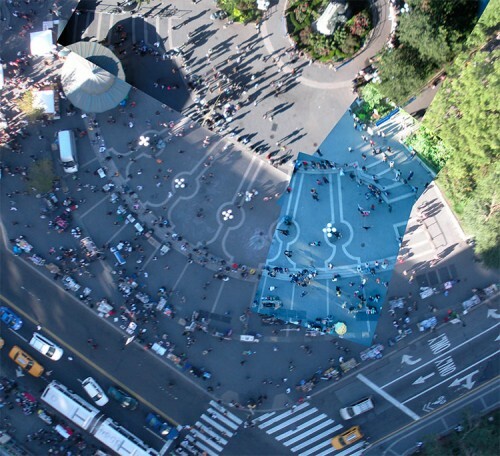 A second component to the project, to be completed by NYC Parks & Recreation, will add a water curtain to function as a play feature for children and station to rinse off. The Splash House outdoor pavilion allows the adjacent Recreation Center to remain open all year long by diverting pool-goers away from one space and into another. Previously the center would suspend activities over the summer to accommodate the traffic of over 130,000 visitors to the pool. With the newly constructed outdoor pavilion to alleviate the attendance crunch, the Recreation Center can retain its original purpose and offer more activities to the Washington Heights Community all year long. The Parsons students have already commenced work on the second phase of the project called In_Flux for interior renovations of the central area of the Recreation Center in hopes of enhancing the site further for area residents. If you walk down Fifth Avenue and 14th Street toward Union Square and notice a building under construction with crooked columns, don’t worry—it is not about to collapse. According to NBC New York, the SOM-designed New School University Center, previously detailed by AN, is raising eyebrows from the local community because some of its columns are slightly skewed. But it’s no mistake. “It's the most efficient way to carry all of the different structural loads of the building from the top of the foundation, " Joel Towers, Parsons The New School for Design dean told NBC. The New York City Department of Buildings has confirmed there are no safety issues with the project. Andrew Bernheimer, of Bernheimer Architecture, is taking over as director of the MArch program at Parsons The New School for Design. Rachel Judlowe, formerly arts and design PR guru at Ruder Finn, is partnering up with architecture and design publicist Elizabeth Kubany of EHK PR. Gensler appoints two principals as new managing directors at its London office: Ian Mulcahey and Duncan Swinhoe, who joined the firm in 2000 and 2004 respectively. Michael Algiere departs Jones Lang LaSalle to join Cannon Design as principal and leader of the firm’s corporate/commercial interiors practice for the New York region. RATIO Architects, with studios in Indianapolis, Champaign, IL and Raleigh, NC is forming a strategic alliance with Chicago-based architects SMDP. 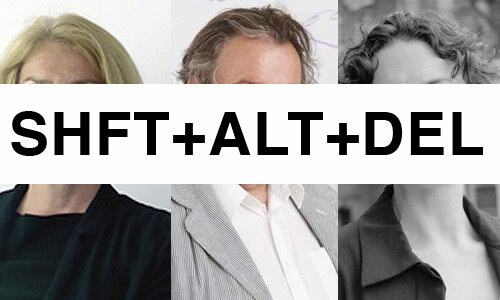 Have news on movers and shakers in the architecture & design universe for our bi-weekly SHFT+ALT+DEL? Send your tips to people@archpaper.com!